his earnest but unheeded plumpings for peace. Joseph Stalin’s actions in 1939, by contrast, were positive, surprising, world-shattering. The signing in Moscow’s Kremlin on the night of August 23-24 of the Nazi-Communist “Non-Aggression” Pact was a diplomatic demarche literally world-shattering. The actual signers were German Foreign Minister Joachim von Ribbentrop and Soviet Premier-Foreign Commissar Molotov, but Comrade Stalin was there in person to give it his smiling benediction, and no one doubted that it was primarily his doing. By it Germany broke through British-French “encirclement,” freed herself from the necessity of fighting on two fronts at the same time. Without the Russian pact, German generals would certainly have been loath to go into military action. Finland, thus giving the Russians carte blanche to move into that country–which they have been trying to do for the past four weeks. – It is widely supposed that Germany agreed to recognize some Russian interests in the Balkans, most probably in Rumania’s Bessarabia and in eastern Bulgaria and the Isthmus. But if, in the jungle that is Europe today, the Man of 1939 gained large slices of territory out of his big deal, he also paid a big price for it. By the one stroke of sanctioning a Nazi war and by the later strokes of becoming a partner of Adolf Hitler in aggression, Joseph Stalin threw out of the window Soviet Russia’s meticulously fostered reputation of a peace- loving, treaty-abiding nation. By the ruthless attack on Finland, he not only sacrificed the good will of thousands of people the world over sympathetic to the ideals of Socialism, he matched himself with Adolf Hitler as the world’s most hated man. The Life. While the new Nazi-Communist partnership may have surprised those whose Russian reading had been confined to the idealistic utterances of such Soviet diplomats as onetime Foreign Commissar Maxim Litvinoff, Stalin’s life reveals numerous examples of cynical opportunism and unprincipled grabbing of power. Sent to a Greek Orthodox seminary at Tiflis at 13, young “Soso” Djugashvili was expelled at 18 from the school because, said his priestly teachers, of “Socialistic heresy.” Thereafter, he led the life of a Russian professional revolutionary. He took part in a railroad strike in Tiflis. He was an organizer in Batum and Baku factories. He had something to do with the series of spectacular robberies that the “revolutionists” engineered. Once a Government-convoyed truck was bombed in the Tiflis main square, and 341,000 rubles ($170,000) in cash was taken from it. Maxim Litvinoff, incidentally, was later caught in Paris with some of this money on his person. “Soso” wandered from town to town in the Caucasus, using numerous aliases. Five times he was arrested and exiled; four times he escaped. In this early life his colleagues sometimes suspected Koba or Ivanovich of buying leniency for himself by handing over their names to the police. Another strange coincidence they noted was that frequently when the comrades got into a tough spot with the police, and had to fight their way out, Koba was rarely on hand. He joined Russia’s radical movement in 1894 and aligned himself with the Social Democratic Party in 1898. He was astute enough to choose the Bolsheviks rather than the Mensheviks when the Party split in 1903. His first contact with revolutionary bigwigs came when he attended a Party powwow in Vienna. Leon Trotsky noticed him in passing; Nikolai Lenin, who had first met him in 1905 in Finland, set him to work writing an article on the Marxist theory of governing minorities. It was in signing this article that he first used the signature “J. Stalin.” “We have here a wonderful Georgian,” Lenin wrote of Stalin at that time. Thereafter the “wonderful Georgian” was to be the Party’s recognized expert on the 174 different peoples that made up Soviet Russia. One of Lenin’s favorite ideas was that if 130,000 landlords could rule Tsarist Russia, 240,000 determined revolutionists could rule a Soviet Russia. Lenin’s efforts before the revolution were to build up a professional revolutionary machine experienced in organizing workers and able to dodge the police. Almost all the big revolutionists of necessity lived abroad; Stalin and Molotov were the only two who were able to brag in later years that they stuck it out for the most part inside. At World War I’s start Stalin was in a prison camp just below the Arctic Circle. He got out when a general amnesty was proclaimed at the Tsar’s abdication in 1917. In the Bolshevik Revolution of October 1917, he was a relatively unimportant member of the Party’s steering committee whose greatest service had been as exiled Lenin’s go-between with colleagues in the 1913 Duma and as an assistant on the Petrograd Pravda. In numerous reorganizations of the governing structure which took place after the Bolsheviks came to power, Comrade Stalin always had a high post, but his work was also invariably overshadowed by the spectacular showings of Lenin, the Party’s chairman, and Trotsky, the War Commissar. Since J. Stalin became the supreme power in Russia, much of the Revolution’s history has been rewritten to magnify his part in those stirring events. Trotsky’s part has been completely erased from Soviet textbooks. Meanwhile, Stalinists claim that their hero: – Fought off the White Russian forces in Siberia. – Defended Petrograd against White General Nikolai Yudenich in 1918. – Saved the Donets coal-mining region from General Anton Denikin’s forces. – Was responsible for early Russian successes in the Polish War of 1920. – Saved Tsaritsin (now called Stalingrad) from capture in 1918. At Tsaritsin there began one of the bitterest political enmities of modern times–the Stalin-Trotsky feud. Trotsky claimed that Stalin, a political commissar at that time, was insubordinate. He demanded and got from Lenin an order recalling him. Thereafter, Comrade Stalin patiently and calculatingly nursed his grudge against Comrade Trotsky. In 1922 Trotsky was offered the post of Secretary General of the Central Committee of the Communist Party, but turned it down. All except Stalin thought it was a mere routine job. Stalin eagerly grabbed it. Stalin saw in it the chance to become something resembling a Soviet Boss Tweed. The Communist Party was growing by leaps & bounds. Comrade Stalin appointed the new secretaries of the expanding organization. Comrade Stalin could not directly punish a recalcitrant secretary, but one who showed too much independence could easily be shifted, without explanation, from a nice post in, say, the Crimea, to a cold outpost in Archangel. By the time of Lenin’s death in 1924 Stalinist bureaucracy was already in the saddle. Probably the most debated point in post-war Soviet history was the “last testament” supposedly left by Lenin. Most salient point in the alleged document was a proposal to get rid of Stalin “because he is too crude.” Stalinists have long denied its genuineness; best Trotskyist argument is that Stalin once quoted it and that Stalin once admitted: “Yes, I am rough, rough on those who roughly and faithlessly try to destroy the Communist Party.” At any rate, Lenin’s proposal could scarcely be carried out against Stalin’s strong organization. During this and the subsequent crucial period the chief members of the Political Bureau of the Central Committee, the Party’s ruling body, were Stalin, Trotsky, Grigori Zinoviev, Leo Kamenev, Alexei Rykov, Nikolai Bukharin, Mikhail Tomsky–seven little bottles hanging on the wall. In 1928 Trotsky was exiled from the U.S.S.R., in 1936 Zinoviev and Kamenev were tried for treason, found guilty, shot. Tomsky attended the trial, committed suicide. In 1938 Rykov and Bukharin went before the firing squad. In twelve years of Stalin absolutism the world has had many conflicting reports of how Socialism in Russia got along. There were accounts of big dams built, large factories going up, widespread industrialization, big collective-farming projects. Five-Year plans were announced. Free schools and hospitals were erected everywhere. Illiteracy was on the way to being wiped out. There was no persecution of minorities as such. A universal eight-hour and then a seven-hour day prevailed. There were free hospitalization, free workers’ summer colonies, etc. To be sure, the collectivization program in the Ukraine resulted in a famine which cost not less than 3,000,000 lives in 1932. It was a Stalin-made famine. The number of wrecks and industrial accidents became prodigious. Soviet officials laid it to sabotage. More likely they were due more to too rapid industrialization. Millions in penal colonies were forced into slave labor. Moreover, Russian officialdom began to experience a terror which continues to this day. For the murder of Stalin’s “Dear Friend,” Sergei M. Kirov, head of the Leningrad Soviet, who had once called Comrade Stalin the “greatest leader of all times and all nations,” 117 persons were known to have been put to death. That started the fiercest empire-wide purge of modern times. Thousands were executed with only a ghost of a trial. Secret police reigned as ruthlessly over Russia as in Tsarist times. First it was the Cheka, next the OGPU, later the N.K.V.D.–but essentially they were all the same. Comrade Stalin recognized their function when, one day, he viewed that part of the walls of the Kremlin from which Tsar Ivan IV watched his enemies executed, was reported as saying: “Ivan the Terrible was right. You cannot rule Russia without a secret police.” After his death Lenin was sanctified by Stalin. Joseph Stalin has gone a long way toward deifying himself while alive. No flattery is too transparent, no compliment too broad for him. He became the fountain of all Socialist wisdom, the uncontradictable interpreter of the Marxist gospel. His dry doctrinal history of the Communist Party is a best-seller in Russia, just as Hitler’s turgid but more interesting Mein Kampf outsells all secular volumes in Germany. He goes in for Nazi-like plebiscites. Hitler won his 1938 election by 99.08% of the voters; Stalin polls 115% in his own Moscow bailiwick. Stalin’s photograph became the icon of the new State, whose religion is Communism. But Joseph Stalin is not given to oratorical pyrotechnics. Only two or three times a year does he appear on the parapet of Lenin’s tomb in Red Square, wearing his flat military cap, his military tunic, his high Russian boots. He attends Party meetings but rarely public gatherings. He has made only one radio speech and is not likely to make many more. His thick Georgian accent sounds strange to Russia. Three Rooms. His life is mostly spent inside the foreboding walls of that collection of churches, palaces and barracks in Moscow called the Kremlin. His office is large and plain, decorated only by the pictures of Marx and Engels and a death mask in white plaster of Lenin. His private apartment, once the dwelling of the Kremlin’s military commander, is only three rooms big. Joseph Stalin has been married twice: first, in 1903, to a Georgian girl named Ekaterina Svanidze, who died in 1907, and then to Nadya Sergeievna Alleluieva, who died in 1932. By his first wife he had a son, Yasha Djugashvili, now in his thirties, and obscure engineer in Moscow. Father and son do not hit it off. By Mrs. Stalin No. 2 he had a son and daughter: Vasya, now 19, and Svetlana, 14. Good-looking Daughter Svetlana is the apple of her father’s eye. The two children go to school, but live in the Kremlin. Joseph’s cackling, gossipy mother, old Ekaterina Georguvna Djugashvili, whom Soviet and foreign journalists used to dote on interviewing, died in Tiflis in 1937. She had for several years lived in an apartment in the former palace of the Tsar’s Georgian viceroy. Novelist Maxim Gorky was a good friend of Stalin, but perhaps his dearest friends were Commissar for Heavy Industry Grigori Konstantinovich Ordjonkidze and Soviet Executive, Committee Secretary Avel Yenukidze. Ordjonkidze died “of a heart attack,” Yenukidze before a firing squad. Defense Commissar Voroshilov has enjoyed the master’s friendship and lived longer than anybody. Best pal of late years is said to be Leningrad Party Boss Andrei Alexandrovich Zhdanov, regarded as Stalin’s heir. Last week rumors flew thick & fast that Comrade Zhdanov was on the skids. His birthday testimonial to Stalin failed to see the light of print. 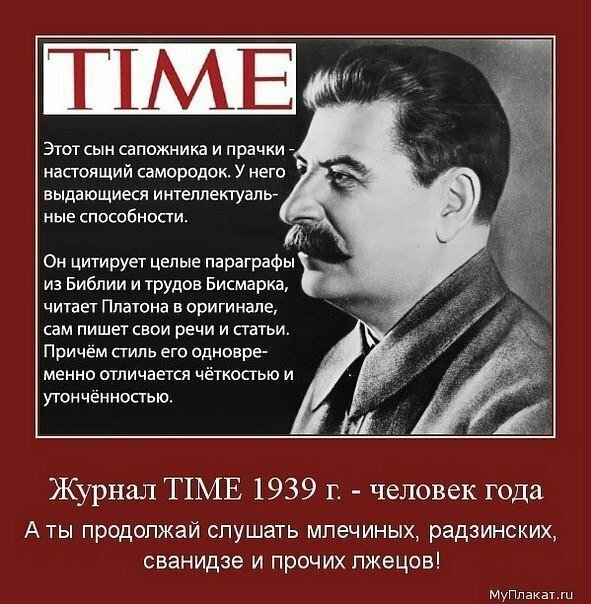 Цитата как раз не только не из редакционной статьи, но и вообще не из TIME. Архив TIME целиком оцифрован в google books. Никаких выпусков журнала с комбинацией таких слов нет. Ни платонов, ни прочих быстрых разумом невтонов. Ни в 1939-40 гг, ни в 1942-43, когда Сталин был повторно назван "человеком года" (заздравницу Роммелю, Ямашите, Михайловичу, Хидеки Того, Сталину и проч. можно прочесть целиком в архиве Time), ни в каких-либо иных годах. Итого: текст в боксе с заглавием "TIME" журналу не принадлежит, и аттрибутирование лжецитаты из TIME является творчеством современного сталинозиаста. Две минуты в гугле выясняют, что фраза в действительности восходит к выражению журналиста и беллетриста Саймона Монтефиоре употреблённому им в интервью французскому журналу Le Nouvel Observateur в 2006 году, и в дальнейшем расцвеченному сталинозиастами, с приписыванием окончательного продукта TIME. Сам сталинозиаст-картиночник, скорее всего, аттрибутировал на картинке фразу журналу TIME не по намеренной злобе, а по обычному для данного социального типа невежеству. В начальной редакции фразы (интервью Монтефиоре) нет никаких "самородков", "Бисмарков" и "цитирований параграфов из Библии". Он же прибавил и "Бисмарков" с "самородками". Последний материал -- редакционный, конкретное авторство неясно; внизу нарисована физиономия Александра Терентьева, редактора отдела "Заграница", но является ли он автором материала или неудачно угодил на страницу волею её составителя -- судить сложно. Ну, а из этой помойки потом уже пошло и массовое чавканье".